Great Dane Rescue in Ohio: Harlequin Haven Great Dane Rescue -- Canines and Humans -- Are You Ready For A Disaster? Disaster season is fast approaching in some parts of the country, and it is imperative to have a pet evacuation plan in place for your pets’ safety. 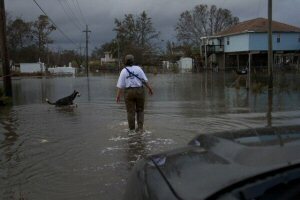 You need not live on the Gulf Coast to fear a disaster. Disasters can occur any time of the year and anywhere—stream and river flooding, fires, chemical spills, and more, happen all too frequently. 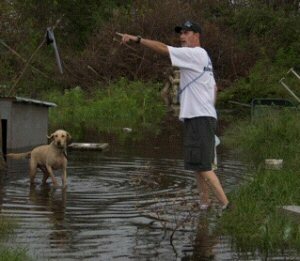 Many lessons were learned about the importance of evacuating with one’s pets in the wake of Hurricane Katrina. Do not let the animals that perished to have died in vain—learn from what happened. Keep your pets’ identification information up to date with the correct phone numbers and address. It is ideal to have both a physical tag on collars and a microchip. Having a secondary number such as the rescue where you adopted your pet, or a trusted friend or family member, is helpful in case you become indisposed. Have a disaster kit ready for your pet: bottled water, food (wet food will enable your pet to need less water than dried food), metal food and water dishes, can opener, pet wipes, flashlight, blanket, vet records indicating ownership and up to date vaccinations, any medications, pet first aid kit, extra leashes and collars, kennel, toy that your pet is familiar with, and photo of you and your pet (sealed in a plastic bag) for identification. Include a list of emergency phone numbers . List all of your numbers—veterinarians, pet friendly hotels, local boarding kennels, and animal shelter and control facilities. Be sure to research boarding facilities and pet friendly hotels far enough away from your area as local places may be shut down due to the disaster. Have a vehicle ready to transport your pet. Communicate with your neighbors prior to a disaster to plan for helping each other, especially with livestock and larger animals. If you do not have a vehicle, have a plan in place to go with friends, family, or neighbors. Leaving your pets to fend for themselves is not an option. During or after a disaster your pets may act differently due to fear and trauma from the weather changes, picking up your fear, or the change in surroundings. Keep this in mind and monitor your pet carefully. Our pets depend on us for their safety. 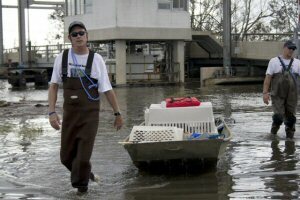 Having a pet evacuation plan in place is a must for you and your pet. When the storm or other disaster clears, you will be glad that your beloved pets are safe. Susan Meyer is executive director of KAT 5 Animal Rescue, and a volunteer for HHGDR. The below pictures are courtesy of Kat 5 Animal Rescue. 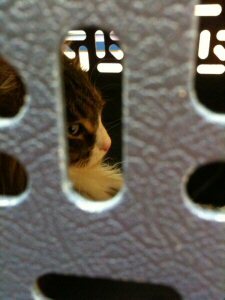 The proper way to transport a cat is in a carrier for his and your safety. A dog left chained to a dog house has no way to get to safety. unsure if he can trust a human after being abandoned.